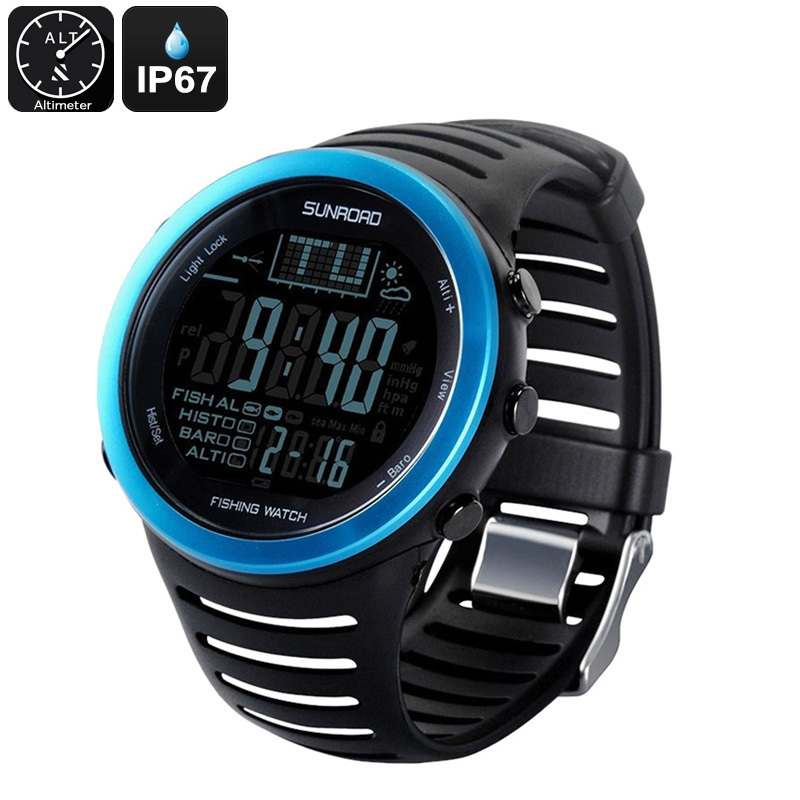 Successfully Added Sunroad FR720 5ATM Fishing Watch - Track 6 Locations, Air Pressure, Temperature, Water Depth, Weather Forecast, Altimeter, IP67 to your Shopping Cart. Never miss the perfect fishing time again thanks to the Sunroad FR720 5ATM fishing watch. This remarkable outdoor watch treats you to an abundance of fishing features that keep you constantly up to date about when is the right time to head out on a fishing trip. This little gizmo is capable of tracking 6 of your favorite fishing locations at once. It keeps constant track of the air pressure, fishing water depth, and temperature. Thanks to its IP67 waterproof design, you can wear it with confidence during your upcoming fishing trips without needing to worry about getting in contact with water. The Sunroad FR720 5ATM fishing watch has been equipped with a super-accurate barometer sensor from Swiss. Thanks to this, you’ll constantly be updated with highly accurate information on the air pressure at your favorite fishing spots. Its smart design even treats you to 24-hour barometric trends and other cool analytical features for you to keep track of the changes in air pressure throughout the day. With its back-lit display, this fishing barometer can be used conveniently at both day and night. Besides the above-named features, it is also capable of delivering an accurate weather forecast for the upcoming day. Thanks to this, you’ll never have to worry again about accidentally getting stuck in the rain while heading out into the outdoors. The Sunroad FR720 5ATM Fishing Watch comes with a 12 months warranty, brought to you by the leader in electronic devices as well as wholesale outdoor gadgets..